UK residential property is a defensive, total return asset class. It’s characterised by a combination of inflation beating capital growth and a growing income stream, closely linked to wages and prices throughout the economy. It has consistently outperformed cash savings, the stock market, bonds and other more volatile investments. Read more about residential property as an asset class here. We believe that residential property will continue to deliver a strong total return, particularly assets selected by experienced investors. We expect continued long-term growth in rents and capital values, thanks to the rapidly increasing demand for quality housing and the structural shortage of supply, common to economically robust locations throughout the UK. Our belief is mirrored by many large investment institutions, who have recently made private rented residential a fundamental part of their UK property investment strategy. Our property sourcing process begins with comprehensive coverage of the market and ends with the negotiation of a purchase of a small minority of the properties we see, which meet our specific performance requirements and exacting quality standards. See below for our current residential property criteria. Properties are favoured which suit our moderate appetite for risk and preference for passive management, i.e. we focus on good quality stock in economically robust areas, with a favourable demand/supply profile for housing, conducive to delivering strong performance over the long term. We choose to part finance acquisitions with a mortgage, typically at 50% LTV, increasing investors’ exposure to growth, and, in many cases enhancing the dividend yield. We seek the best available terms from our panel of well know lenders and usually choose to fix the interest rate for 2-5 years to provide a degree of certainty over income performance. Ultimately, our decision to use “gearing” and the mortgage terms selected depend on a considered assessment of the potential benefits, relative to pricing and market conditions, at the time of a property’s launch. 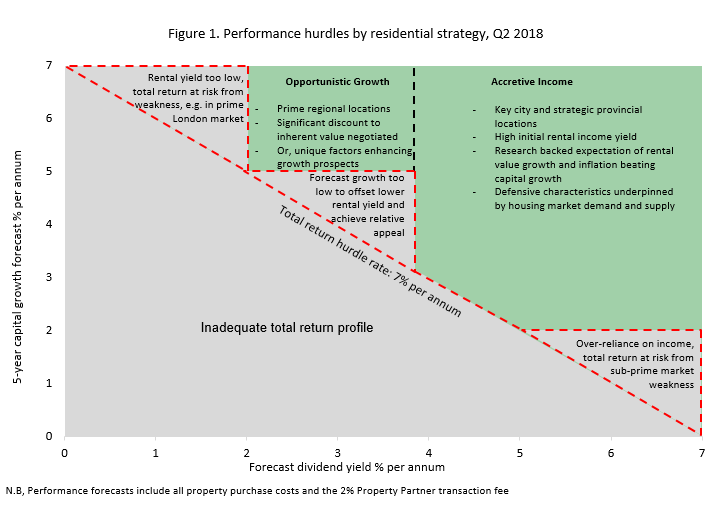 Short-listed properties are grouped into two strategic categories based on the performance we believe they can deliver; “Accretive Income” and “Opportunistic Growth”. Our core Residential Acquisition Strategy in present market conditions is predicated on a robust and growing income. This is supported by a detailed, research-led analysis of potential rental and capital value growth, completing an attractive total return profile with downside protection. Major cities, predominantly in the Midlands and North of England, which benefit from robust economies, a strong and diverse employment market and continued public investment into regeneration and infrastructure e.g. Birmingham, Leeds, Manchester. Desirable locations within easy travelling distance from employment hubs. Markets characterised by strong demand for housing from renters and owner occupiers, underpinning capital and rental values e.g. choice locations in the Midlands, North West and Yorkshire. We rule out economically frail locations with potentially weak occupier demand. and professional cash buyer, we’re ideally placed to negotiate the best possible deals for our investors. larger cities in the South West, such as Bath, Bristol and Exeter. their rental income and our research based forecasts for capital growth, to determine whether they meet our specific requirements. In-house technology is used to efficiently search the market on a daily basis, with new listings filtered according to the characteristics which ensure fundamental suitability for the platform e.g. multiple units to mitigate the risk of vacancy and be suitable for gearing. Off-market opportunities are sourced through our network of professional property investment contacts. We use our expert knowledge, gained through decades of property investment experience, to rigorously appraise properties, avoiding the pitfalls to which untrained buyers can fall victim, therefore minimising risk. Every property we acquire is visited by a member of our property team, who carries out a full assessment of the physical attributes and potential appeal to renters. Our in-house property legal team conduct searches to ensure there are no hidden complications concerning leases, covenants or charges held against the property. Put simply, buying property is our day job. We believe we add significant value for investors through our comprehensive process of appraisal and due diligence. Final approval to purchase is given by the investment committee, which includes the investment director, the CEO and the CFO. The panel determine whether our required levels of quality and the minimum performance criteria are met. From the point of receiving the green light from the investment committee, a property can be launched on the platform within a week. The value of your investment can go down as well as up. The Financial Services Compensation Scheme (FSCS) protects the cash held in your Property Partner account, however, the investments that you make through Property Partner are not protected by the FSCS in the event that you do not receive back the amount that you have invested. Forecasts are not a reliable indicator of future performance. Gross rent, dividends and capital growth may be lower than estimated. 5 yearly exit protection or exit on platform subject to price & demand. Property Partner does not provide tax or investment advice and any general information is provided to help you make your own informed decisions. Customers are advised to obtain appropriate tax or investment advice where necessary.